In the end, I decided to not hang each little bottle from a tree branch, which was my original plan. 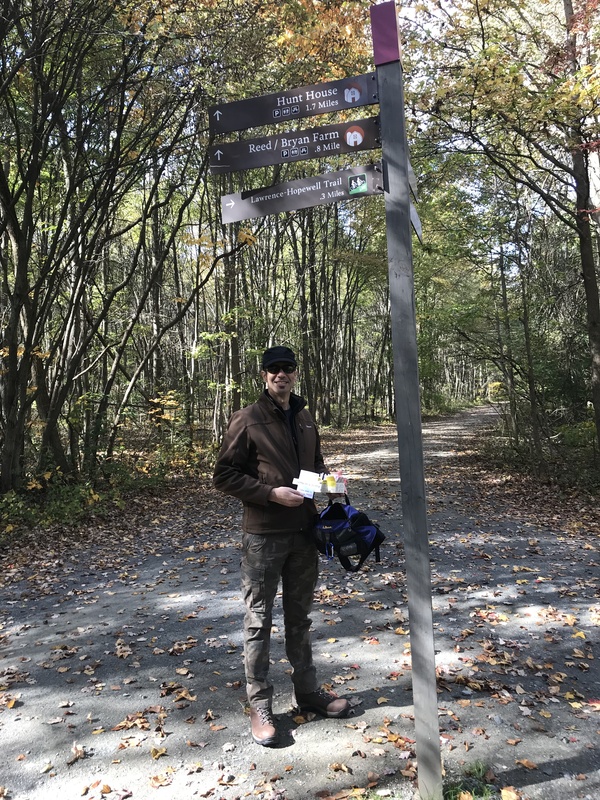 Instead, I made a small sign (to be clear that they are free to take and are not contraband of some sort) and hung them all on a trail signpost. I’m hopeful that my installation will catch the eye of passersby, despite the distractions of smartphones and earbuds. 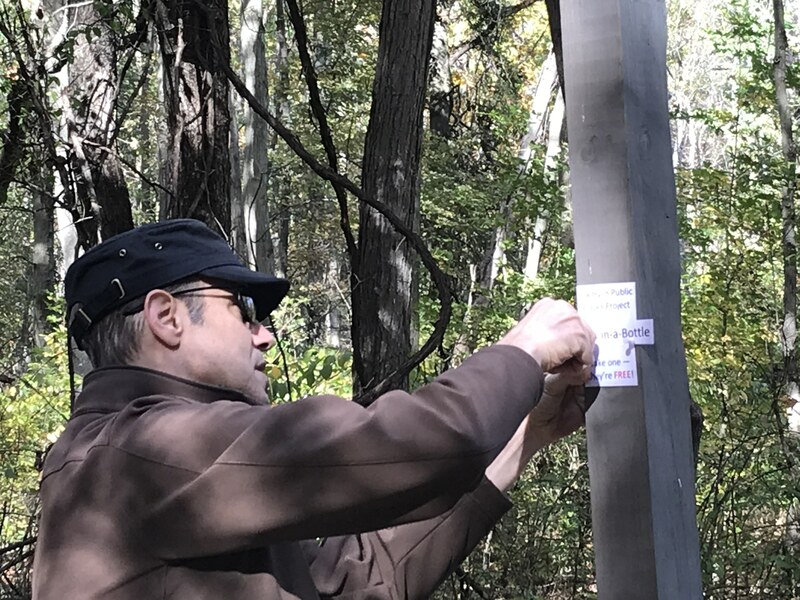 The materials in hand: tanka bottles, the sign, a piece of string, and two pushpins. 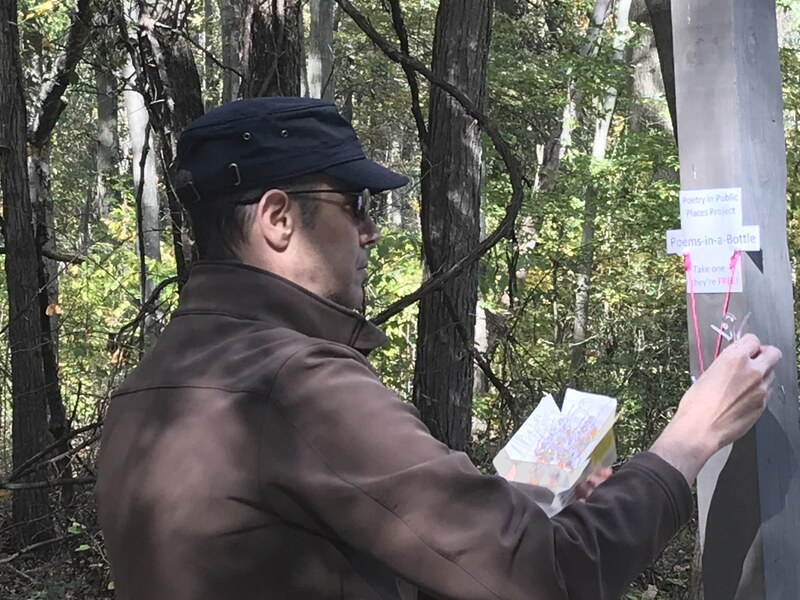 I’ll go back to that signpost in a few days to see how my project is faring. I don’t expect much if any traffic this rainy Sunday, but the weather is predicted to brighten up in a day or two. 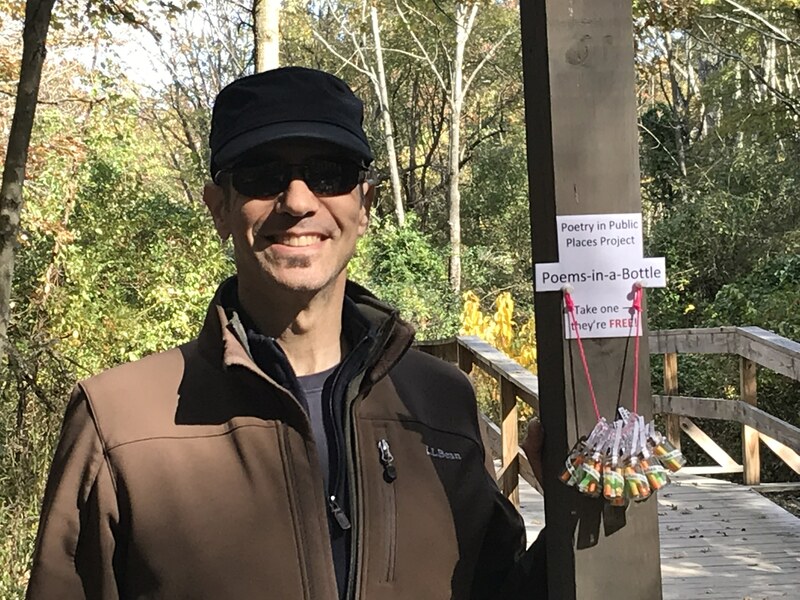 In an effort to bring a little bit more poetry to people in public places, I’m currently working on what I call my Tanka in a Bottle project. 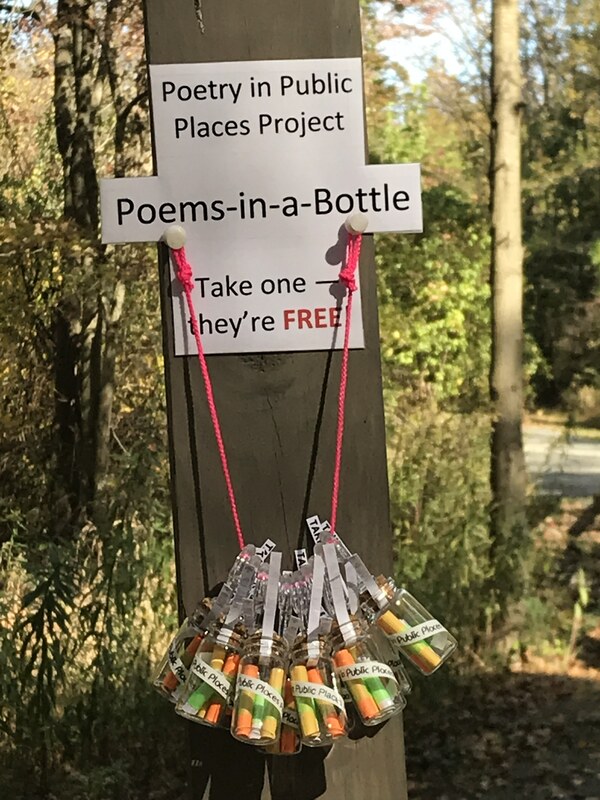 Each little bottle will contain a pair of tanka — one by me, and one by my friend and talented U.K. poet Caroline Skanne — and a blurb about the Poetry in Public Places Project, a Facebook / real-world group I started in 2016 to create and promote poetry placed in urban and natural landscapes. 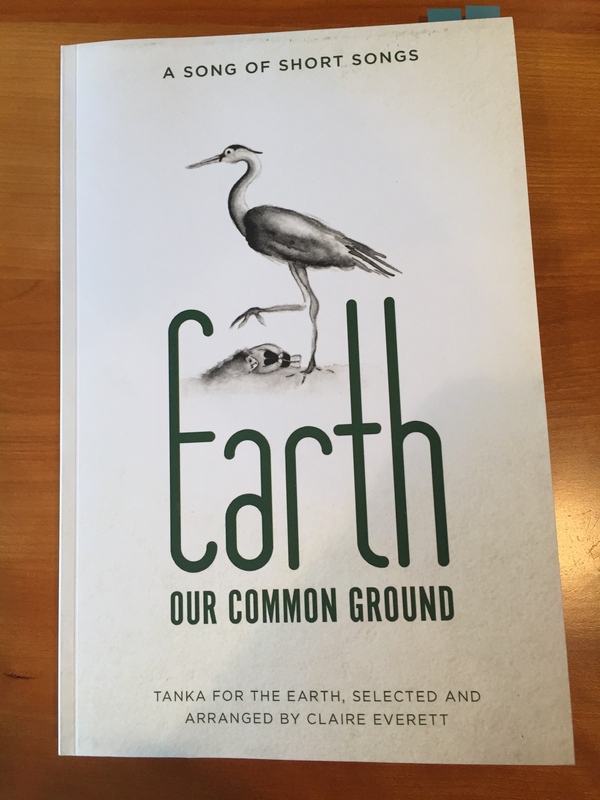 In total, each batch of 10 bottles will showcase 20 different tanka. 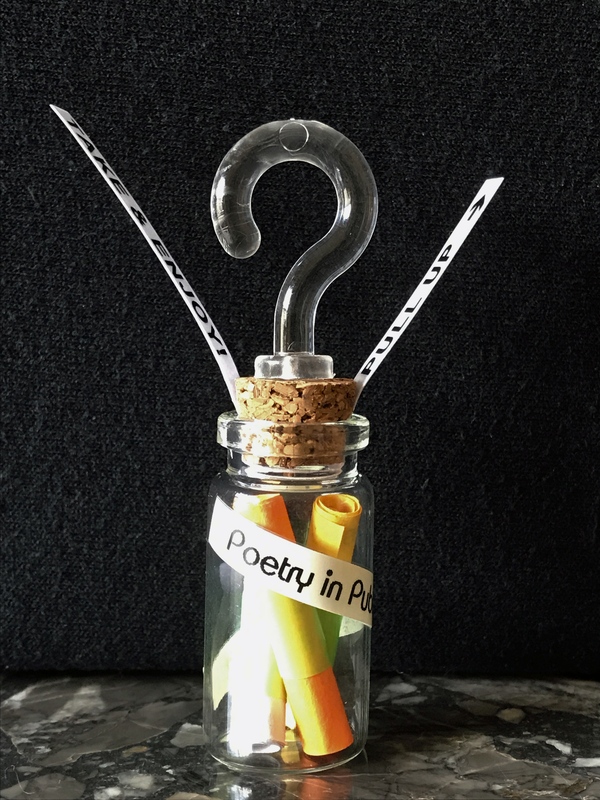 Tanka in a Bottle (prototype 2): components. Tanka in a Bottle (prototype 2): assembled. 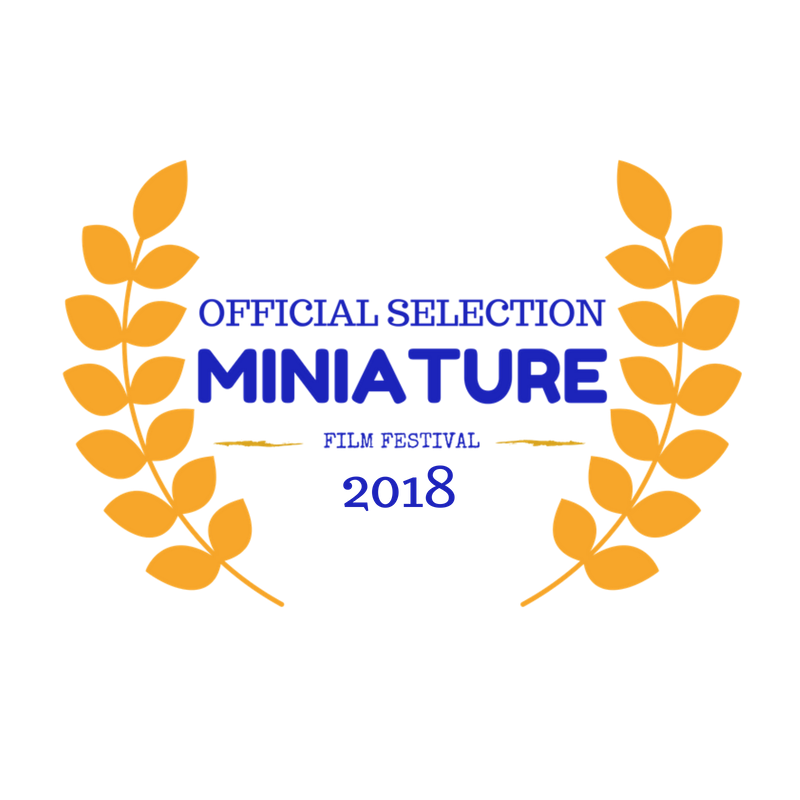 The multitalented Caroline Skanne is a poet (@CarolineSkanne), the founding editor of Hedgerow: A Journal of Small Poems (@hedgerowpoems & hedgerowpoems.wordpress.com), and the founding publisher of Wildflower Poetry Press (@wildflowerpoems & wildflowerpoetrypress.wordpress.com). 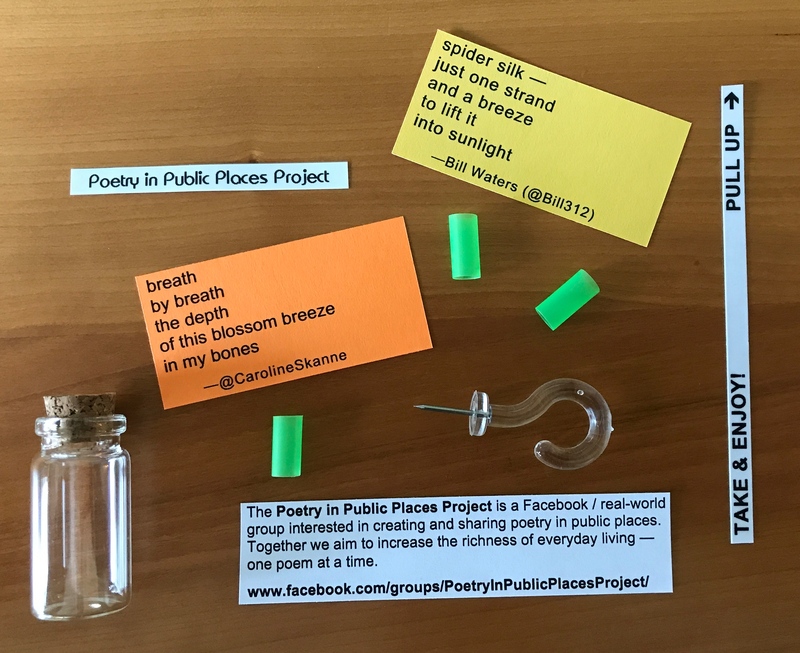 To learn more about the Poetry in Public Places Project, please stop by www.facebook.com/groups/PoetryInPublicPlacesProject/. painted on the brick wall . . .
almost dawn . . . Published in the anthology Neon Graffiti: Tanka Poetry of Urban Life, November 2016.
this withered tulip . . . Published in the spring/summer edition of Ribbons, the journal of the Tanka Society of America, July 2015.
of the sleeping cat . . . Published in American Tanka (http://www.americantanka.com/june-2015-issue-25/bill-waters/), 6/26/15.